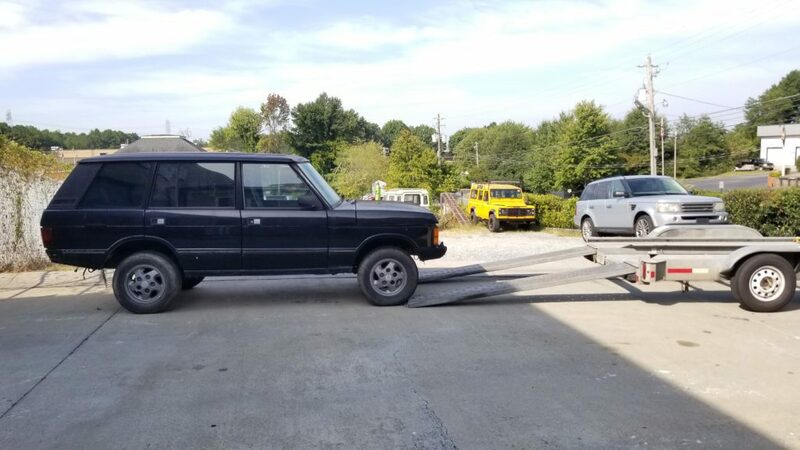 My Land Rover friends have been wrapped in the drama of Spenny, my rusty 1993 Range Rover County LWB, for the past five years. Spenny was my first car, a de facto replacement for the 1994 Discovery my parents bought new and planned to give me when I turned 16 in 2006. In late 2005, it got totalled in a Nor’Easter by a massive tree limb. 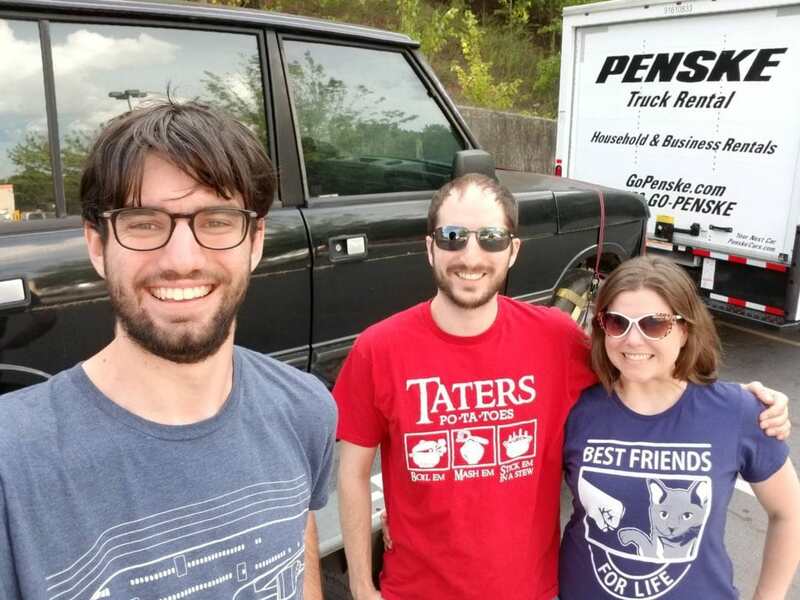 I bought Spenny from another Land Rover enthusiast in Arlington, Virginia, towed him back to New Jersey, and put 50,000 miles of adventures on him from 2007 to 2015. Then like all Land Rovers of that era, he got quite rusty. So, I sourced Duncan, my 1994 Discovery, as a “stopgap” car so I could take time to fix Spenny. A project himself, I spent months changing head gaskets, replacing bushings, and rewiring. Then I learned that buying cars that had been off the road for five years took a lot of work to drive again. So I spent a lot of time and money making it a pretty nice driver. Then I really liked the Discovery. I daily drove it. I drove it to rallies. I drove it to California. And Spenny sat. Earlier this summer I tried to revive Spenny, but the rust was really, really bad. So I decided to source a rust-free body in the South to do a body swap. 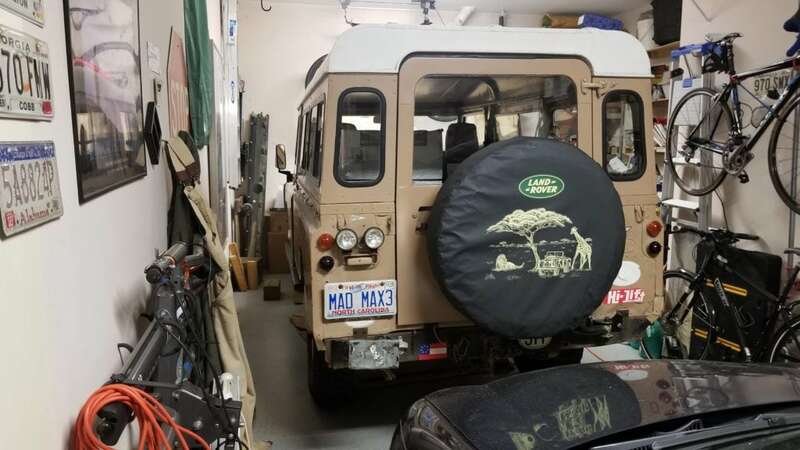 My friend Max Thomason found me one at his Land Rover shop in Atlanta, a 1994 County LWB. Black on the outside (sprayed over the original Montpelier red), with a rare-ish black leather interior, it was actually a pretty decent truck. It was supposed to have engine issues, but nobody was that sure. It had been sold to the shop in 2013 or so and used as a parts truck, but 98% of it was there. We struck a deal, I bought it for $500 with a title, and I booked a flight to Atlanta. At some point, I realized that this rust-free body I planned to swap onto Spenny’s chassis…would also have a rust-free chassis. So, I decided that I’d just fix up the new one and make it the Spenny replacement second truck. 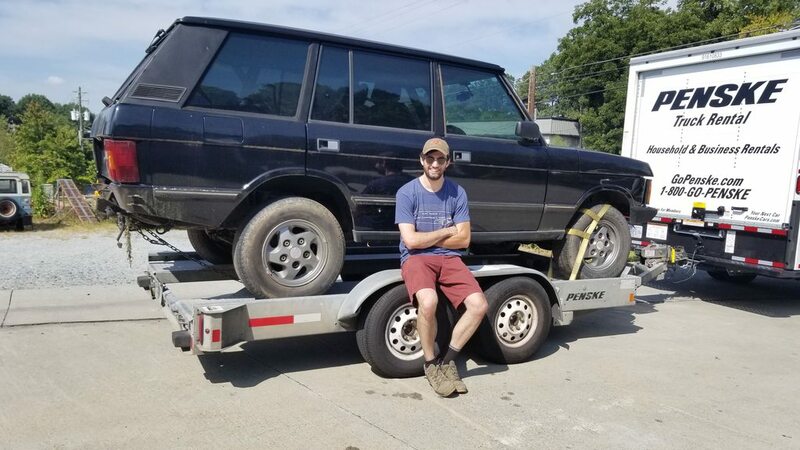 Of course, for this new project, I could have probably picked a better base vehicle, but I was locked into this one at this point, and besides, I do love me a good Land Rover Reborn project. So here I am again…fixing up a truck that has been off the road for five years. I stopped stripping out Spenny’s interior with the old plans to rebuild him and decided instead that I would transfer what was needed to the new truck, then strip Spenny down to a rolling chassis to be slowly tinkered with for some sort of future hybrid trail truck project. 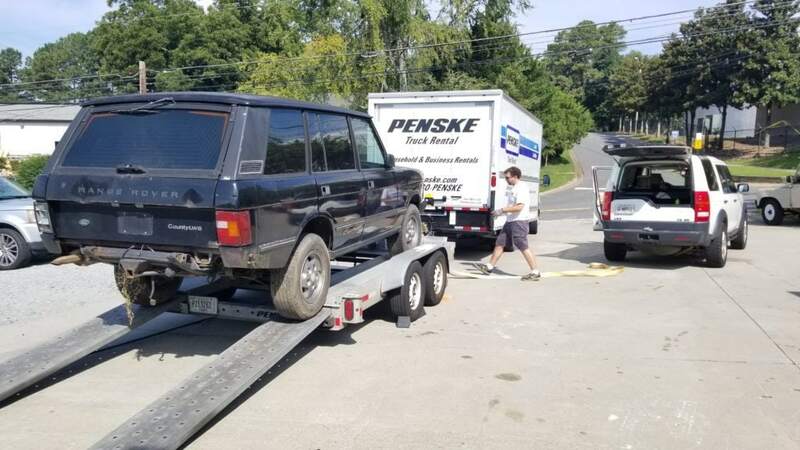 Duncan will need some work after the new Rangie is revived since I never totally finished that rebuild, so that was also a goal of the project. It’s tough when the truck is your daily driver; you can’t just let a project sit in the driveway and tinker with it when you feel like it, or you are never going anywhere. For example, I need to repair or replace all the door latches and lock actuators, but I can’t really drive without a latch! Max picked me up in his LR3, and we picked up burgers and beers at Grindhouse Killer Burgers. 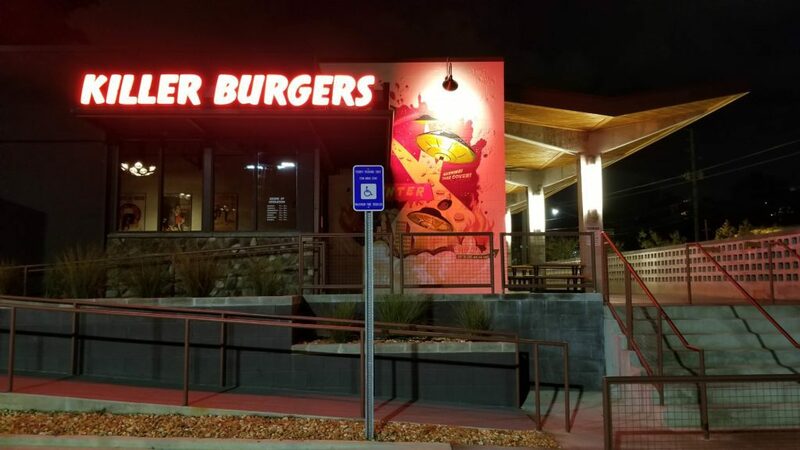 It’s a local chain, mostly in Atlanta with a few other Georgia locations, and the double Apache Style and a pitcher hit the spot. 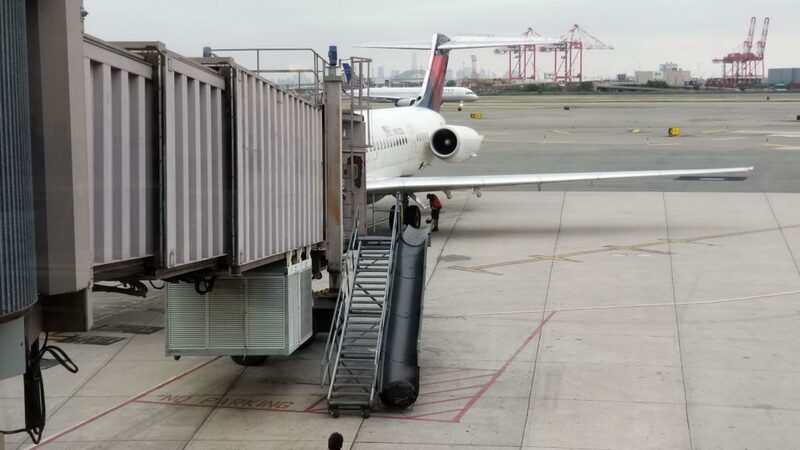 Terminal B at EWR has almost no food (compared to the cornucopia that is Terminal C), and all I had on the plane was a few of Delta’s iconic Biscoff cookies, so I was about to pass out. We headed back to Max’s house, kibitzed a bit, and checked out his Series III 109″, which he’s had since 1999. It’s an ex-MOD left-hand-drive vehicle. It may have also been used in one of the Reverend Billy Graham’s Crusades, according to previous owner lore. He and I have been looking into it a bit, and apparently, the Reverend broadcast a 1989 sermon from London to Africa via satellite, after which recordings were brought to remote villages. It’s possible this truck was one of those used to transport these recordings across Africa in “Mission 89.” More research is needed. I slept for a few hours, then we were up early to start the day. First off, though, a proper Southern brekkie at Home Grown, an Atlanta restaurant near Max’s house with some of the best chicken and biscuits I’ve ever had. 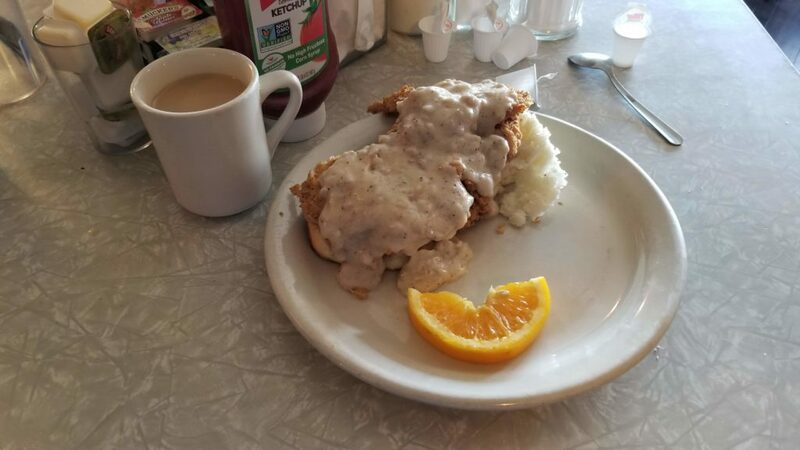 Okay, actually, the only chicken and biscuits I’ve ever had. Still, it was one of the most epic breakfasts I’ve ever had, and I’m from New Jersey, home of Taylor Ham/Pork Roll. 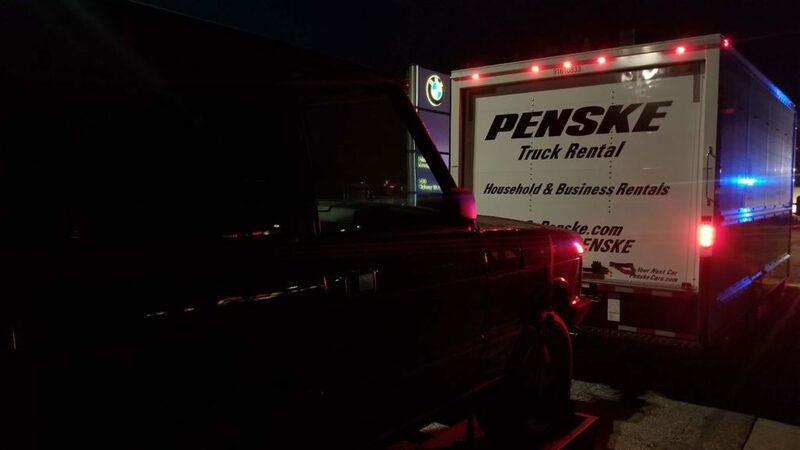 We picked the Penske truck and trailer up, which took about a half hour, and then headed across the center of Atlanta to the place where I was picking the truck up. Max had dealt with the paperwork, and the shop was closed, so it was already hauled outside the fence yesterday. I had him drive the Penske across the city’s notorious Downtown Connector, the stretch of I-75/85 that has some of the worst traffic in the country. It wasn’t bad early on Saturday morning, but I still took the chance to try out his LR3 in chase, briefly rethinking my choices in second vehicles. And there it was: my glorious new truck. My third Rover of my own, fifth in my family. All there in its revived parts truck glory. 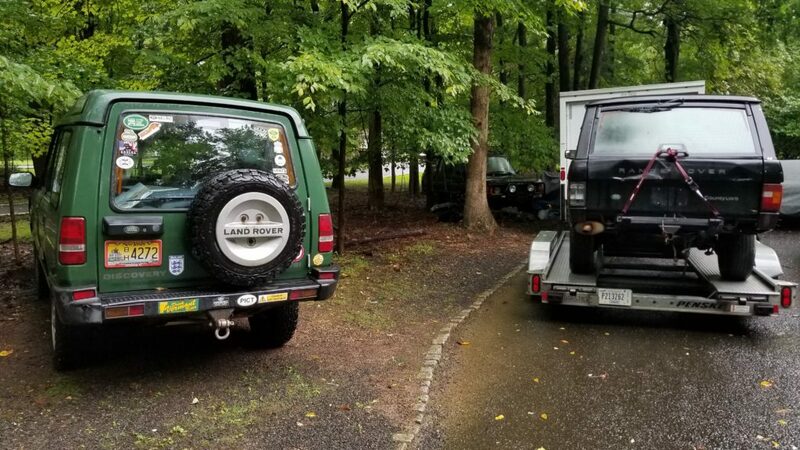 Time was short, so we hooked the Rangie up to the LR3 and hauled it on, since the truck doesn’t run. This involved shackles, confusion, and using cell phones on speakerphone as walkie-talkies. Then, with a few test drives around the block, I was off, driving a box truck AND a trailer for the first time ever. I didn’t have much time for social calls, but my timing was such that I could stop off to see my friends Jen and Greg, former members of my curling club who had just moved to the Atlanta area, without messing up my timeline (because a man’s gotta eat anyway!). We had a blast catching up — I really, really miss having them back at Plainfield. And so began…the schlep. 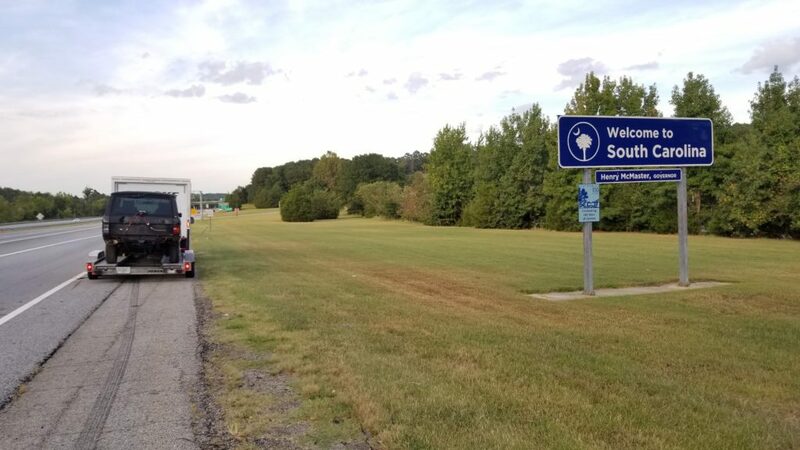 First, South Carolina hit, and so Butler left Georgia, one seriously lucky former parts truck. I had to swing by the BMW factory in Spartanburg, to get a picture with the sign. There was a cop protecting a DOT worker doing some lawn mowing, but he was nonplussed that I parked my giant truck right in front of the entrance. 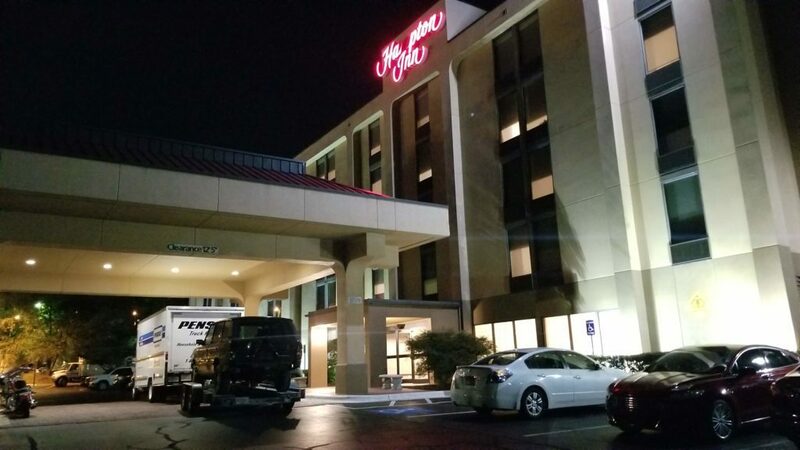 I made it to Gastonia, North Carolina that night, after a lot of slow driving — I’m just not used to how wide a box truck is, the slow speed hauling a car behind it, and tracking the whole package together. It’s even tougher at night! I parked across six spots and crashed in my room until it was time to hit the road again. The next day was a slog home. I had to get from Charlotte to New Jersey in time to sleep and go to work tomorrow. On paper, it’s not a bad drive, a bit over 600 miles. But the remnants of Tropical Storm Gordon were coming over Virginia and Pennsylvania, and after a calm ride through North Carolina, the rains started to pour somewhere around Roanoke, Virginia. Most of the day was a slog, going slow with the heavy, unwieldy load. As I got closer to Pennsylvania, it just got worse. The one highlight was crossing the Mason-Dixon Line, officially making Butler a Northern Truck. 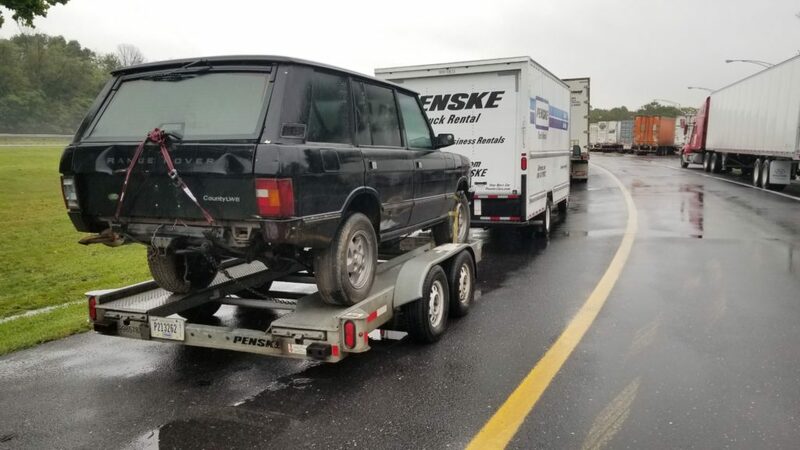 Pennsylvania was a slog, with rough roads — as I say, “Under Construction Since 1776.” Every joint in the road clattered the entire assembly, and I was sure I was either going to break the trailer in half or lose the Rangie. Finally, around 10 PM, I pulled into the driveway. Too wiped to deal with anything, I left the whole Penske assembly (which I had through Thursday anyway) to deal with later and headed off to bed to go to work. Of course, with my luck, I ended up with strep throat when I woke up, so I spent most of the week working from home, feeling too crappy to work on the truck. And so now, I have a fleet of three. It is only going briefly look like this, though. The old RRC LWB, Spenny, goes to a friend’s house soon, where I’m going to cut it down to a rolling chassis for a Range Rover Classic-styled off-road trail rig project. But I have to admit it’s pretty swank having three classic British luxury cars…all built between 22 February 1993 and 6 May 1994. By the way, where’s the name Butler come from? Well, of course, that famous fictitious Georgian, Rhett Butler. I figured that Gone with the Wind was a good source for a name, especially as I’ve enjoyed visiting the Margaret Mitchell House several times over the years going to Atlanta for book industry conferences. My trucks tend to be male, contrary to the norm, and it was between Rhett Butler and Ashley Wilkes. Rhett is a bit rough around the edges, Ashley meant saying “Ashley, but it’s a guy” too much, and Wilkes has too much reference to the Wilks Brothers who created the Land Rover — Spenny was already named after Range Rover designer Spen King, and I wanted to go another way. So I figured Butler was a good name, and went well with the classy black-on-black color scheme and general Range Rover swankiness. Now it’s the project of reviving a parts truck with unknown issues. I will be going through every inch of this truck the next few months, refining and improving and rebuilding. If getting the Discovery ready for the California trip was the Bachelor’s in Rovers, this is the Masters. As for the Ph.D., that’ll be whatever I do with Spenny! Keep an eye out for future blogs here on all these projects for sure.